In 1806, Londoners paid their respects to Lord Nelson. 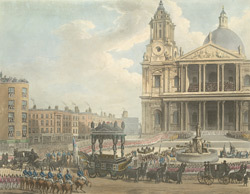 Such was Nelson's popularity that dense crowds gathered to watch the funeral procession as it snaked its way from Hyde Park to St Paul's Cathedral. The processors included naval comrades, militia regiments, officials, government ministers, the lord mayor and his aldermen, noblemen and the Prince of Wales (seen standing nearest the coffin).